Although a couple of challenging inventions of our age have been related to the transmission and recording of the sound, our understanding of modernism, the avant-garde and postmodernism does not seem to have been transformed by the sound. Artists did not take advantage of the new technologies; and in fact contributions to the art of the sound are diverse, and historically incoherent. 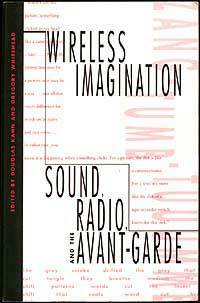 WIRELESS IMAGINATION/SOUND, RADIO, AND THE AVANT-GARDE is a brilliant collection of original essays and newly translated documents on the art of the sound composed with the aim of breaking the "deafening silence" which surrounds the sound, as the editors claim. It does not require a thorough inquiry to assume that the literature on the arts of the recorded, broadcasted sound and of the conceptual, literary, and performative sound is scant and, instead of discussing its history, one can only speak of its "non-history" since there is not a coherent tradition of a self-described and autonomous art of the sound. We live in a culture of visuality in which the eye is privileged over the ear. The sound is either thought of as an object, or as a metaphor for the unspeakable, or when artistic expression is concerned the sound is understood as music. Like the avant-garde considered noise and sound extra-musical, Cage´s well-known efforts were, in a similar way, directed towards integrating the sound-the whole acoustic universe-into the domain of music. Radical attacks on music ultimately returned to music. Although the acoustic phenomena: silence, noise, groove, transmission, interference have received currency in contemporary theory, the history of the art of the sound can be described only as a couple of isolated moments. It is not the editors´ purpose-both of them being audio artists-to offer theories of aurality but intend to document and chart the "dissonant and cacophonous sonographic resonances" that create these moments. This volume covers the period of 1886-1960s ending with the experiments of Burroughs and Cage, and the classical era of the German Hörspiel. As Edison´s phonograph offers perhaps the most provocative moment in the arts concerning aurality, Charles Grivel´s essay deals with the taboo and the horrifying consequencies of sound reproduction proposed by Villiers de l´Isle-Adam´s novel about "the phonograph´s papa". In his essay, Douglas Kahn relates the acoustic scenarios of Raymond Roussel´s Locus Solus to death. Craig Adcock, while describing the impossible aural objectives of Marcel Duchamp, attempts to interpret the ready-made objects as the art of acoustic expression. Dziga Vertov´s proposal for a phonographic "Laboratory of Hearing" and the zaum language and Radio Sorcery by Velimir Khlebnikov are interpreted as another significant yet sole moment in the art of the sound by Mel Gordon. Gregory Whitehead´s essay is about the iconoclastic castaways of F. T. Marinetti´s and Dino Masnata´s "La Radia"-the wireless imagination, which serves as the title of this volume. Antonin Artaud´s radio talk show, had it been allowed to be broadcasted, could have been a unique acoustic performance, writes Allen S. Weiss, well before the classical German Hörspiel, which broke the literary conventions of the radio sound plays in the sixties. This collection of essays is concluded by Cage´s modern acoustic concept and his search for new ways of performing music and the ventriloquism of Burroughs but hopefully will be followed by a future volume on more contemporary art of the sound-from the Fluxus to Hip Hop, as the editors promise.